Furillen was unusual – it sprang up and disappeared in a very short time. There was no fanfare for closure, and no time for a reprieve. And that was right. Gertrude Jekyll, the great garden designer of the early 20th century, never wanted her gardens preserved. Without the gardener, the garden ceased to be a dynamic expression of her creativity and became someone else’s fixed idea of what it was. Serene Footman shrugged the usual title of owner, and as janitor cultivated the sim for things to flourish within it. And without his continued cultivation it would not have been Furillen. That is not in an egotistical sense, but as in gardening you can control the initial conditions, but after that it is down to other factors. Personally, I generated more photographic and video work at Furllen than any other place, and The Constant Falling is still the piece I think is my best work. This was never intentional. I didn’t want to get locked down to one place – which is possibly both a strength and a failing of mine – yet I kept getting drawn back. 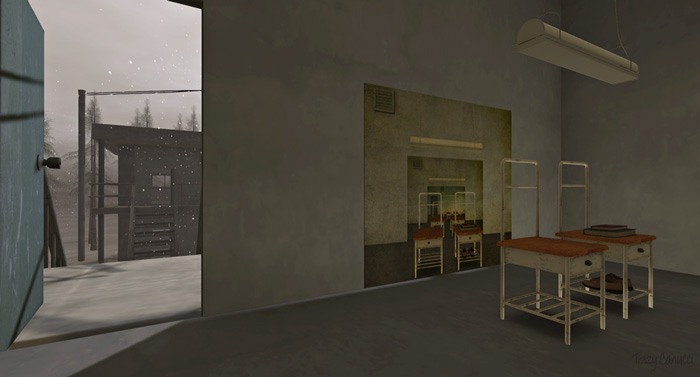 I generally join the Flickr groups for the places in Second Life that I photograph, and over the years I was the itinerent photographer visiting between one and three a week, I accumulated most of the groups for the main places. So, I’ve gone through my list, and as of 1st May, there were over 6,092 images in the Flickr group for Furillen. Only Wastelands, one of the longest standing multisim places in SL exceeds this with 6,410. No other place gets close, including classics like Drylands and Insilico that were or have been around much longer. Yet what was there at Furillen? It was a sparse environment that invited creativity by offering so many possibilities. This was no self-contained artistic statement, with opening notices that call the crowds to gawk, that invite adulation and never critique. It was a place that never would be finished, and an invitation for others to say more – and the Flickr statistic is one measure of that. And if, as Doreen Massey claimed, places are processes, Furillen’s real difference as a place was that it was a faster and more dynamic process. So that leads to the next question. How much was Furillen a space and how much a social community? And again I’ll turn to Doreen Massey; ‘what gives a place its specificity is not some long internalized history, but the fact that it is constructed out of a particular constellation of social relations, meeting and weaving together at a particular locus’. For me, that’s an accurate description of Furillen, but it also highlights a paradox of Second Life. Although it is so ephemeral, people still create habits and form attachments to places, as if they have permanence. Maybe this reflects a desire to escape the unpredictable threats and challenges of real life1. However, the consequence is nostalgia, and with the ephemerality of spaces in Second Life, the losses accumulate quickly. Second Life is not a place for those who cannot regenerate and move on. ‘Constellation’ is a particularly apt metaphor – stars are not close together in distance, they just appear that way from Earth. So it is with online spaces, where people come together to form their chosen communities, unhindered by accidents of geography2. And Furillen was the perfect example of a space that existed as a ‘constellation of social relations, meeting and weaving’. So farewell to Furillen. It was a great ride. I don’t see this is a problem. Humans have continually sought escapism since they sat round a fire and told stories to each other. It is a component of play, another inherently human trait. While this is true, geography and time zone are inherently tied together. But in online spaces, geography is secondary to time zone. Massey, Doreen (1994) Space, Place and Gender. Cambridge: Polity. pp.153-156.